I wanted to let you know that we had the wedding of our daughter at our home on Sept. 26th. It was a beautiful Saturday and we had 56 guests. The arrangement and the space you and your team have built was just perfect to nicely accommodate all and we are grateful for the added support under the outward extension of the deck. The front side too was glistening attractive and befitting such an event. It was a great day – thank you and your team for the excellent work done. I wish to express my thanks to you and your assistant for making such a fine and attractive ramp. It is a masterpiece of carpentry. Should I need similar projects, I shall surely call on you. Please express my thanks to your team for their excellent design and execution. Roadrunner Decks did superb work for us. We went from a concrete slab to a full decked out patio with a custom access ramp for my elderly mother. They were reasonably priced and had great quality craftsmanship. 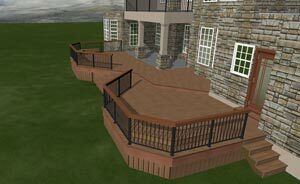 We would recommend them to anyone needing a deck or patio. 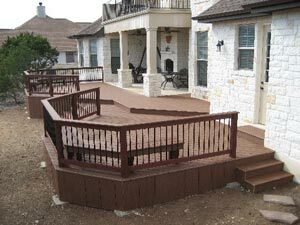 Roadrunner Decks and Fences – A Quality Contractor We designed our own cedar privacy fence for our residence in Castle Hills and solicited bids for construction. Michael and Byron understood our plans and built it to our specifications. They even discussed some added design features we had not thought of, which we agreed to. The entire project was built with input and collaboration between us and the contractor. 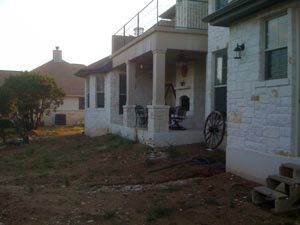 Their attention to quality and detail is evidenced by the craftsmanship in every aspect of the fence. There were no unexpected surprises or problems, cost over-runs or delays. We continue to receive positive comments on this fence (which is very visible from the street) and never hesitate to recommend this company to our friends and neighbors. Both father and son were a delight to work with.